BUFFALO – Nicolas Deslauriers started off as a fill-in. The Manchester Monarchs only had two forwards lines early in training camp, so the 23-year-old, one of 10 defensemen on the AHL club, moved up to the wing. Still, Deslauriers struggled early on as a forward. He wasn’t playing much. Then a couple of recalls moved him up to the first line. “I’ve just been scoring almost every second game and everything, put up some good numbers,” said Deslauriers, who had 18 goals and 39 points in 60 AHL games. Deslauriers’ play began to catch the Los Angeles Kings’ attention. General manager Dean Lombardi told him about month ago he could earn for his first NHL recall soon. Then Deslauriers was sitting on his couch Wednesday, watching TSN’s coverage of the NHL trade deadline. He knew the Kings were rumored to want former Sabres winger Matt Moulson. Sure enough, the teams made a deal, but it involved prospects and draft picks. Deslauriers was going to the Sabres. Deslauriers made it to Rochester at 8 p.m. Thursday and finished unpacking 90 minutes later. Exhausted, he went to bed thinking he would make his Americans debut Friday. At 11 p.m., the phone rang. Deslauriers didn’t recognize the voice on the other end, Amerks coach Chadd Cassidy. With two forwards injured, the Sabres needed Deslauriers in Florida, Cassidy said. He left Rochester at 6 a.m. Friday and debuted in the Sabres’ 2-0 loss to the Panthers, skating 15:08. 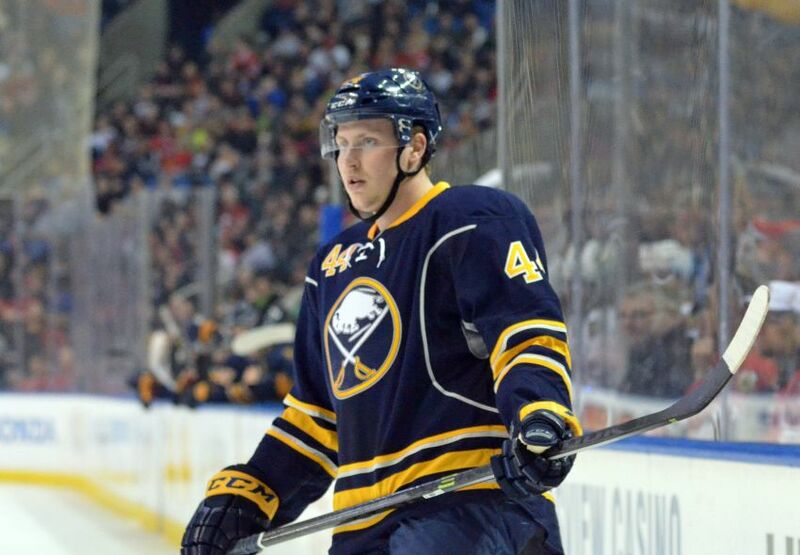 Deslauriers skated on the left wing beside Brian Flynn and Ville Leino on Sunday. He also manned a point on the power play. Would Deslauriers be in the NHL if he had stayed at defense? Deslauriers said he likes to play aggressively, which often didn’t help him as a defenseman. “My lack of responsibility in the D-zone, I was always going as a fourth forward almost,” he said. Deslauriers, 6-foot-1 and 209 pounds, played with interim Sabres coach Ted Nolan’s son, Jordan, in Manchester. Ted Nolan had watched film of Deslauriers.